A small family-owned winery in the Napa Valley founded in 1993. 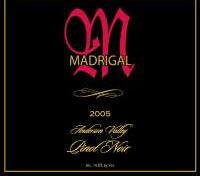 Madrigal is a producer of several varietals including Cabernet Sauvignon, Petite Sirah, Zinfandel and Pinot Noir. The vineyard sources are Toulouse and a vineyard on Mendocino Ridge. The wines are sold on the website. Tasting by appointment Monday through Friday at the winery in Calistoga.